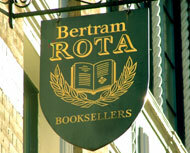 When Bertram Rota founded this company in 1923 it was in order to specialise in Modern First Editions, a field of book collecting that he pioneered, encouraged, developed and sustained virtually single-handed at that time and the one that has remained the central plank of the business that bears his name today. He set high standards of bibliographic research, expertise, accurate description and fair pricing in his early, ground-breaking catalogues and these standards have been maintained in over 300 catalogues that have followed. In the past eighty years we have been privileged to have pass through our hands the First Editions of the majority of the creative writers in the English language working from the late nineteenth century to the present day and ranging from items of the utmost rarity to the most commonplace. We have been instrumental in helping to form very many collections, large and small, private and institutional, throughout the world and to the precise requirements of our clients in their particular areas of interest. Our accumulated expertise and unrivalled knowledge of the field of Modern First editions is, as it has always been, freely available today to all collectors who care to enquire.